Cuir Beluga is a popular perfume by Guerlain for women and men and was released in 2005. The scent is sweet-powdery. The longevity is above-average. It is still in production. Cuir Beluga is part of the collection "L'Art et la Matière". Last year I was happy. Happy smelling Jade/SoOud. Nobody can get to ∞ I thought. Conclusion: Guerlain and I are going great. Further insight: I like vanilla. Vanilla goes with them also always, and - is often also from the game. So to get back to Jade, my favourite seductive vanilla perfume: I didn't expect anything similar to it. I was so enthusiastic about the special feature of this fragrance. And then the pocket sprayer Cuir Beluga arrived (thank you, Azura). Surprise - Jade clearly had one player in the league. Do I have to make up my mind now? The Sillage of Cuir Beluga is more perceptible for me, but the durability of Jade is somewhat better (in the evening on it, in the morning still in the nose), whereby Cuir Beluga is also tidy. And - the Cuir Beluga bottle is plain, the way I like it. I am now no longer specifically Jade or Cuir Beluga or Spiritueuse Double Vanilla decayed. But definitely a vanilla lover and this one is decaying. The perfumes are a highlight for the autumn and also for the following cold winter. So I'm looking forward to it and to more that will give me vanilla. Beluga. Although the name stands for the white whale, it reminds me of something completely different. Something that's even fictional. Namely Beruga, a character from a video game that I had played more than 15 years ago and that has remained in my head until today, because of the great story and because of the happy moments of success in the game, which just grabbed me back then. (For those who are interested, the game was Terranigma on Super Nintendo,... what a feeling it was to get your own ship at some point, with which you could travel the whole game world,... I digress...). The fragrance begins immediately leathery, but also slightly citric and vanilla-sweet at the same time. The mandarin has certain difficulties in perceiving it correctly, but it can still be sniffed in the ascending scent, at least for a short time. The aldehydes seemed to me to be even shorter, and they seemed to have evaporated again immediately. The leather and the vanilla smell immediately and also quite intensively. Later there are some flowery notes in the background, but I can't identify them. Fortunately, they don't smell stuffy, even if a strawflower should sound dry somehow, if you can smell it at all. Even later, the scent continues to smell sweetish vanilla, while the leather becomes a little weaker. In addition, there is a little amber and, if you are sniffing concentrated, some heliotrope, whose fragrance reminds a little of almonds. The Sillage is only good at the beginning, but it falls off quickly, so that it is more above average. Even if he can be sniffed at one of them, I think he is a bit too weak for the winter, but well, as I said, it's still okay. But the durability is quite high, because it lasts more than twelve hours. The bottle is rectangular and has gold metal plaques on the sides. The name of the fragrance is written on it and you can see the logo of Guerlain. 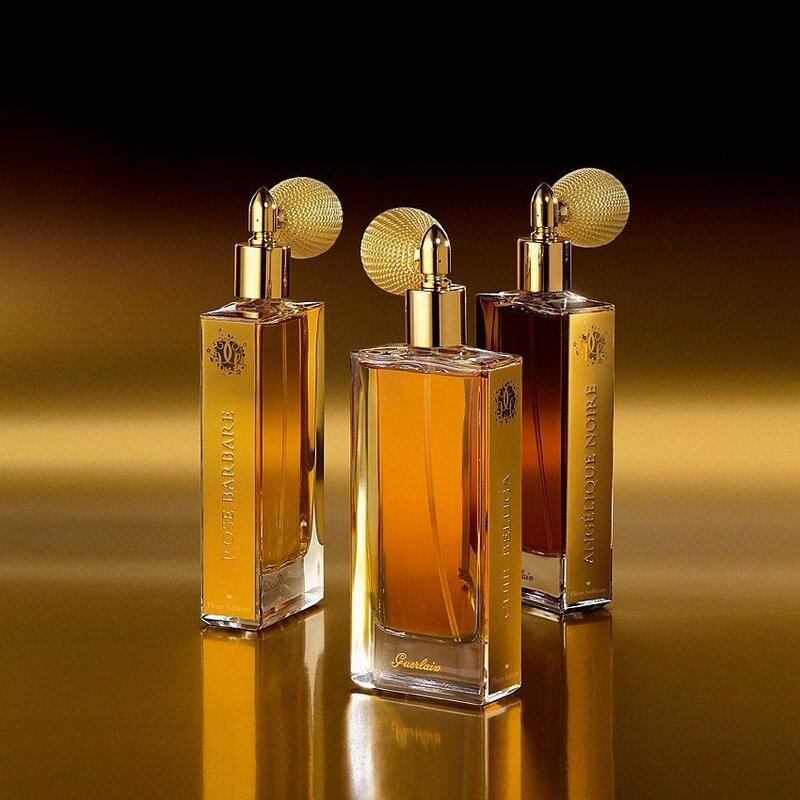 The front and back of the bottle are transparent so that you can see the golden scent liquid. The name Guerlain is written at the bottom of the thick glass. The fragrances are delivered with a golden spray head and a nice pump ball, although I think I was recently told that the pump balls had been abolished... Anyway, a beautiful and nobly made bottle. Like all L'Art et la Matière fragrances, this fragrance cuts a very good figure here, smells good, but is unfortunately a bit weaker in its charisma, at least for the fact that its fragrance is more in autumn and winter. But because it is not so strong, I call it an all-rounder, so that it could also be used in low doses in spring. From beginning to end, this fragrance speaks of luxury. Like white suede chamois gloves or the soft white leather interior of a luxury car, it doesn't get any better than this. Initially I get a very delicate, sparkling mandarin orange balanced by aldehydes. The soft, vanilla-heliotrope background is joined by the dry, honey-like texture of immortelle flower. Followed by Amber and more vanilla in the dry down. This is a minimalist composition of only 15 ingredients, this is very different for a Guerlain fragrance (most of which are very rich and complex). I think that whilst this is minimalist, it speaks of quality all the way through. A beautifully balanced, quiet, sweet and soft fragrance which really lets people know you have taste. In a class of its own, really. his fragrance opens with aromas of vanilla, patchouli and leather. The notes blend into an unusual accord: a sweet, slightly salty, chocolate leather accord. I do not know if it is just my imagination but the saltiness reminds me of brine. The vanilla and patchouli notes balance this interesting facet which otherwise could have been rather off-putting. The fragrance is smooth and sophisticated and makes me think of an exotic milk chocolate bar made with goat’s or lama’s milk. If I had to name a scent sibling for this Guerlain offering I’d chose Odori’s Iris. Guerlain CUIR BELUGA is really the Emperor's New Clothes of leather perfumes. How strange that one would want to make a non-leather leather fragrance. After all, no one forces a perfumer to make a leather perfume, so he/she can always choose to create another lightly floral amber vanilla instead, and that is in fact what we have here. I'm not saying that every leather perfume must approach CABOCHARD, but CUIR BELUGA is much closer to L'Artisan Parfumeur BOIS FARINE! It doesn't make sense strategically, either, I think. When I took out my sample vial of CUIR BELUGA, I looked forward with great anticipation to a new leather perfume that would be refined and sophisticated, perhaps something really out of the ordinary. What I thought I could certainly count on was something very daring--isn't that the point of leather frags, after all? Leather is an intrinsically eccentric note--the very antithesis of most. Instead, I found myself wearing a pleasant, but rather nondescript linear scent with a touch of the gourmandise of IRIS GANACHE and ANGELIQUE NOIRE in a floury-amber, not a leathery base! What a disappointment. Write the first Review for Cuir Beluga!